TPMS or Tire Pressure Monitoring System is an electronic safety system that monitors the tire pressure of vehicles’ tires. According to the NHTSA, underinflated tires may adversely affect fuel economy and lead to skidding, loss of vehicle control, hydroplaning on wet surfaces, increased stopping distances and an increase in tire failures. There are two main types of TPMS: indirect and direct. Indirect TMPS systems use the vehicle’s anti-lock brake system’s wheel speed sensors to detect low tire pressure. Direct TPMS systems use tire pressure sensors inside the tires that communicate through radio frequencies (RF) with a receiver and TPMS processing unit that alerts the driver to an under inflated tire. Some TPMS systems also measure temperatures and will alert the driver to tires overheating. 95% of all TPMS-equipped vehicles in the United States use a direct system. 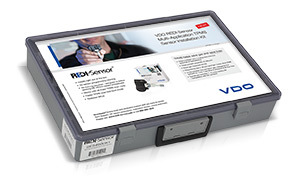 TPMS sensors are available in three styles: snap-in, clamp-in and banded (valveless). Snap-in and clamp-in sensors attach to the wheel rim, just as conventional tire valves do. Banded sensors attach to the centerline of the wheel using a tensioned band. Direct TPMS systems offer many service opportunities for the automotive technician including TPMS sensor replacement and TPMS service kit replacement. A hardware component kit is comprised of TPMS sensor parts that should be replaced during every tire service as preventive maintenance to maximize the usable life of the sensor. Service kits for clamp-in sensors include: a hex nut, valve core, valve cap, grommet/seal and metal washer, but kits may also include a valve stem and retaining screw, depending on the application. 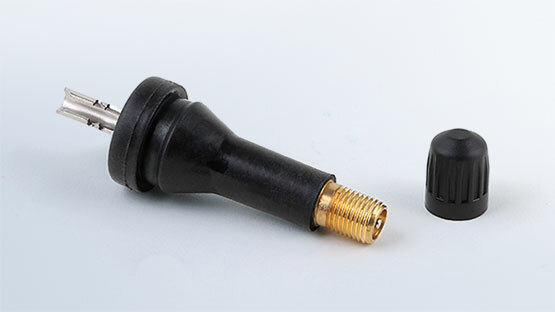 For snap-in sensors, service kits include: a rubber-coated metal valve stem, valve cap, valve core and retaining screw or nut, unless a notched press clip design is used (Continental). As of 2007, the United States Department Of Transportation (through NHTSA) requires an installation of a Tire Pressure Monitoring System to all new passenger cars, multipurpose passenger vehicles, trucks, and buses that have a gross vehicle weight rating of 10,000 lbs. or less (except those vehicles with dual wheels on an axle). The legislation requiring TPMS was passed in reaction to Congressional hearings on vehicle rollover deaths caused, in part, by vehicles with underinflated tires.